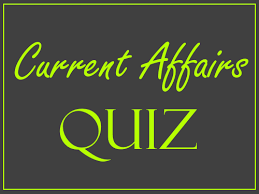 The Current Affairs Quizzes given in this write-up will give an insight of the major events which are recently happened. Such MCQs on current events are quite useful for IAS Exam 2017 preparation. It is quite essential to study hard to cover current affairs, one of the essential parts of the IAS Exam. To study current affairs for IAS Prelims and IAS Mains Exam requires a continuous and steady practice on daily basis. Here, in this article we have provided current affairs quizzes based on the events happened in India and around the world. I. The agenda for next year is to transform, energise and clean India. II. Plan and non-plan classification of expenditure is done away with in the Budget for 2017-18. The agenda for next year is to transform, energise and clean India. Plan and non-plan classification of expenditure done away with in the Budget for 2017-18 to give a holistic picture. World Bank expects GDP growth rate at 7.6 pc in FY18 and 7.8 pc in FY19. Merger of Railways Budget with General Budget brings focus on a multi-modal approach for development of railways, highways and inland water transport. Allocation under MNREGA increased to 48,000 crore from Rs 38,500 crore. This is highest ever allocation. Agricultural sector is expected to grow at 4.1 per cent this fiscal. I. The concept of Universal Basic Income (UBI) is as an alternative to the various social welfare schemes in an effort to reduce poverty. II. As per the Economic Survey 2016-17 Universal Basic Income (UBI), on the principles of universality, unconditionality and agency, is a conceptually appealing idea but with a number of implementation challenges lying ahead especially the risk that it would become an add-on to. III. As per the Economic Survey 2016-17 UBI that reduces poverty to 0.5 percent would cost between 4-5 percent of GDP, assuming that those in the top 25 percent income bracket do not participate. The Economic Survey 2016-17 tabled in Parliament today by the Union Finance Minister Arun Jaitley has advocated the concept of Universal Basic Income (UBI) as an alternative to the various social welfare schemes in an effort to reduce poverty. The survey juxtaposes the benefits and costs of the UBI scheme in the context of the philosophy of the Father of the Nation, Mahatma Gandhi. The Survey states that the Mahatma as astute political observer would have anxieties about UBI as being just another add-on Government programme, but on balance, he may have given the go-ahead to the UBI. The Survey says the UBI, based on the principles of universality, unconditionality and agency, is a conceptually appealing idea but with a number of implementation challenges lying ahead especially the risk that it would become an add-on to, rather than a replacement of, current anti-poverty and social programmes, which would make it fiscally unaffordable. (ii) Centre-State negotiations on cost sharing for the programme. 3. Recently, the Union Cabinet has given its approval for amendments of which of the following orders? The Union Cabinet chaired has given its approval for amendments in (i) the Constitution (Scheduled Castes) Order, 1950 to modify the list of Scheduled Castes of the State of Odisha, and (ii) the Constitution (Pondicherry) Scheduled Castes Order, 1964 so as to change name of the Union Territory from Pondicherry to Puducherry in the Order. The Bill namely Constitution (Scheduled Castes) Orders (Amendment) Bill, 2017 incorporating the above changes will be introduced in the Parliament. Proposal of Sualgiri, Swalgiri caste, as per approved modalities, was found to be eligible for its inclusion as a synonym of Sabakhia caste at Serial Number 79 in the list of Scheduled Castes of Odisha. Further, the name of Union territory of Pondicherry has been changed to Puducherry vide the Pondicherry (Alteration of name) Act, 2006 w.e.f. 01.10.2006. Accordingly, an amendment is needed in the Constitution (Pondicherry) Scheduled Castes Order, 1964 to this effect. I. The amendment Bill provides for inclusion of Indian Institute of Information Technology Design and Manufacturing (IIITDM), Kurnool along with the other IITs in the Principal Act. II. IITDM Kurnool will be declared as an institute of National Importance with the power to award degrees to students. III. The Indian Institutes of Information Technology Act, 2014 confers the status of Institutions of National Importance on the IIITs and also provides for matters connected with administering these IIITs. The expenditure for the operationalisation of IITDM Kurnool is incurred from the Plan funds of the Ministry of Human Resource Development. The emerging needs of the industry and the economy, as a whole for skilled technical manpower is expected to be met from the talent pool of trained personnel of the Institute. The Institute shall be open to all persons irrespective of gender, caste, creed, disability, domicile, ethnicity, social or economic background. I. Ensuring 90 days of salary occupation in a financial year. III. Strengthening grassroots procedures of democracy. The popular MNREGA or Nationwide Non-urban Career Assurance Act is designed at improving the income protection of the people in rural areas by ensuring hundred days of salary occupation in a financial year, to a rural family whose associates offer to do inexperienced guide work. The purpose of the Act is to make resilient resources and enhance the income source platform of the rural inadequate. The choice of works recommended in the Act deal with causes of serious hardship such as famine. Therefore, by observing the main aims and objectives of this government scheme, people can easily understand the benefits of the program. Strengthening pure natural resources under control via works that deal with causes of serious hardship like famine, deforestation and ground break down and so motivate maintainable growth. Strengthening high decentralization as well as deepening procedures of democracy by providing a critical part to the local Panchayati Raj, Organizations in planning, tracking and execution.